Getting ready for the early season? Fly fishing wet flies is the way to go. In early season the rivers are flowing high and cold, there’s little surface activity, (which would be better for a dry fly), and fish are eating ‘baby’ or larval insects, which we imitate with the wet fly. Dry flies are typically fished upstream and allowed to drift in a natural manner, but the wet fly can be fished in several ways; upstream, downstream, across the river, and with or without rod action. Versatility! 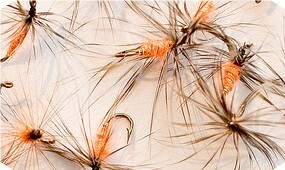 A good technique is to cast diagonally across the stream and let the fly swing down in the current without drag. If or when you feel the fly dragging, lift the rod tip and retrieve the line in short pulls. It’s usually during this last tugging action that you’ll get your strike. How fast should you retrieve? That’s an unknown variable and the only way to figure it out is to experiment with short fast, long and slow – mix it up. Fly fishing wet flies technique Each time you complete your cast, place the line on your rod-hand forefinger so when you’re retrieving the line, the line is sliding over that finger. Keep your hand relaxed but your wrist somewhat stiff. This will give you complete control of the slack and make it easier to hook your trout. If you just start pulling line in without this slack control the rod no longer commands the situation. When the cast is fished out, just drop the line and do it again. Presentation As you get the hang of fly fishing wet flies you can start to modify your cast according to the speed of the current and the depth of the river. In a quiet pool you can risk casting straight across stream but when your line sweeps below you, the fly will be bumping the bottom. You know you’re not getting good results anytime you can see the fly on the surface of the water. To adjust the drift of the wet fly, release a few yards of line just as the belly of the line gathers speed. If the current isn’t strong enough to pull that out for you, shake your rod up and down a few times and the line will glide through the guides. This will allow the fly to sink deeper. Where to cast when fly fishing wet flies. When you see slick places in choppy water, you’re on to something. They appear around boulder tops, fallen logs, and undercut banks. But you don’t want to cast right at them or your bug won’t be in place when it gets to target. The goal is to have the fly reach the fish just as the line completes its swing across the surface. 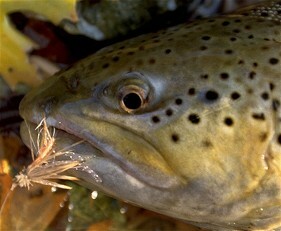 Same rule applies if you actually see a trout splash – cast above him so that your fly swings in front of his nose. The hard part – the STRIKE! Sometimes we get lucky with dries and a fish hooks itself without a set. Not gonna happen when fly fishing wet flies. You must lift the rod up and back with enough pressure to set the hook without ripping his lips off. (Your line will snap.) If you feel a rubbery bite and don’t react in time, don’t panic. Leave the fly in the water, give it a few twitches, and get ready – he might strike again. Now go get your line wet! Click for Video Play Trouble with that link? Just go to the video page and click, "Leave Your Hat On!"